Hamas hangs two men who were convicted ten years of ago of collaborating with "the occupation". Hamas hanged two men accused of collaborating with Israel on Saturday, a statement from the interior ministry of the terror group’s government in Gaza said, according to the AFP news agency. The ministry said that it had executed the two men in accordance "with what Palestinian law stipulates", identifying them as "the collaborator with the occupation A.G., 49, and the collaborator H.K., 43." A military court in Gaza had sentenced the two to "death by hanging after the tribunal convicted them 10 years ago of charges ranging from collaborating with a hostile foreign entity", to involvement in "killing and espionage", the statement said, according to AFP. A number of representatives from civil organizations attended the execution, the statement said. 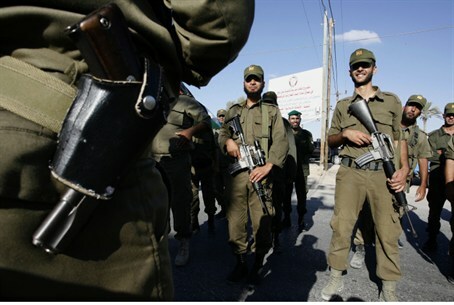 The Hamas government executed three men in April 2012 after they were accused of "collaborating" with Israel. On Thursday, a Palestinian Authority (PA) Arab man found guilty of the same charge was sentenced to death by a military court in Gaza, which is controlled by Hamas. It was the fifth such sentence handed down by the authorities in the coastal enclave since the beginning of the year. Under the PA law, collaboration with Israel, murder and drug trafficking are all punishable by death.